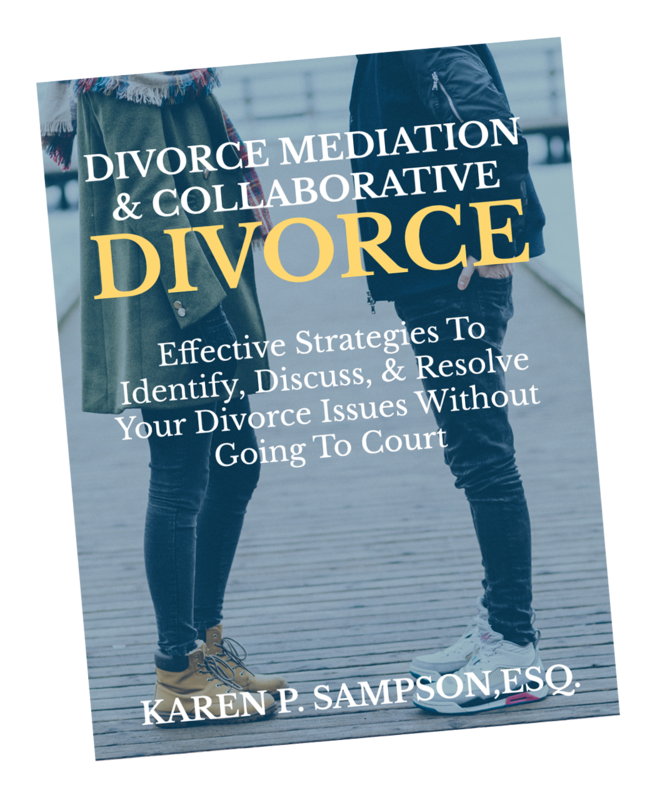 Collaborative Divorce and Divorce Mediation are alternatives to litigious divorce that provide divorcing couples the opportunity to resolve divorce issues outside of Court in a non-adversarial environment. Both alternatives are geared toward providing privacy, dignity, and control to divorcing couples. They should not be interpreted as ways to either “go easy on your spouse” or “get one over on your spouse,” but rather as ways to get through a difficult situation in a fair, equitable manner, while trying to maintain as healthy a family relationship as possible. Thinking “outside the box” is often used in order to find creative, acceptable solutions. Mutual respect and trust are needed. Common goals help to manage and resolve issues. Both alternatives require that the couple demonstrate good faith and provide full disclosure of finances. In addition, both alternatives require each spouse to be initially screened to assure the process chosen is appropriate, taking into account the couple’s relationship history and situation. Collaborative Divorce is a process that directs the divorcing couple’s attention to the best interests of the family. The couple resolves their divorce issues outside of court with collaboratively-trained attorneys. In addition to each spouse retaining a collaboratively-trained attorney, neutral, collaboratively-trained financial and mental health professionals may be brought in to focus on specific issues. The couple looks to settle their issues, handle the family transition, and move forward with their lives. Although each attorney advocates for his or her client, everyone works together, and in doing so the couple retains control of the process. A series of meetings are held to discuss the divorce issues. No adversarial tactics or threats of litigation are allowed. An atmosphere of honesty, cooperation, and integrity geared toward the future well being of the family is relied upon. If negotiations break down and either spouse decides to stop the collaborative process and proceed with a litigious divorce, both of the collaborative attorneys must withdraw their representation. In this event each spouse must retain new attorneys to represent them in the litigious divorce. Divorce Mediation provides an environment where divorcing couples can identify and resolve divorce issues with a Mediator; an impartial third party. The Mediator’s role includes acting as a facilitator and identifying divorce issues. During mediation sessions, the Mediator typically asks questions, offers suggestions, and encourages a healthy discussion. As the Mediator’s role is not an attorney role, the Mediator cannot provide legal advice to the couple. Therefore, each spouse may decide to retain an attorney to consult with in between mediation sessions. This allows each spouse to be knowledgeable of his or her legal rights and at the same time negotiate in a non-adversarial manner. The couple works together to resolve their divorce issues. Together, the spouses become the architects of their settlement. When the mediation process is completed, the Mediator typically prepares a Memorandum of Understanding (MOU) which is not binding on the couple but contains the mediated terms. Each spouse typically takes the MOU to his or her individual attorney to review the mediated terms and continue with the legal divorce process.